So far all the mug cakes recipes I’ve come across have all been chocolate. While I love chocolate cakes, sometimes I’m in the mood for something lighter and more refreshing like a white cake with fresh fruit. So I set about trying to create a simple white cake. And since blueberries were on sale, I added some fresh blueberries to the batter. My first attempt was a failure. 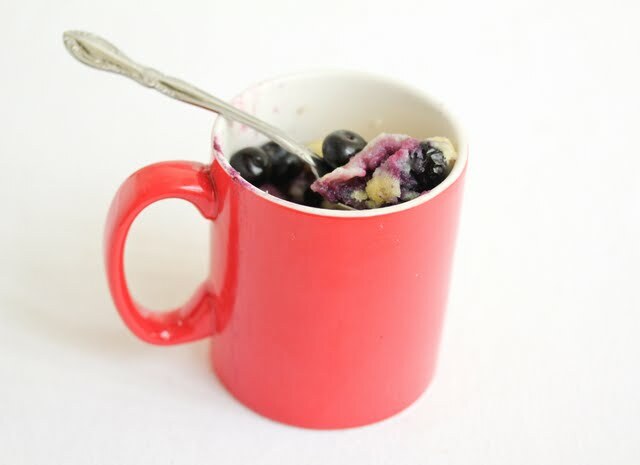 But on my second attempt, I create a pretty fluffy mug cake filled with fresh berries. Delicious. The cake did lose some of its softness after it cooled so it’s best eaten warm. I am pretty pleased with this recipe though I might experiment a little bit more to see if I can create an even softer and fluffier cake. This cake was so easy to make. Just as easy as all the other mug cake recipes and only needed 1 1/2 minutes to cook. 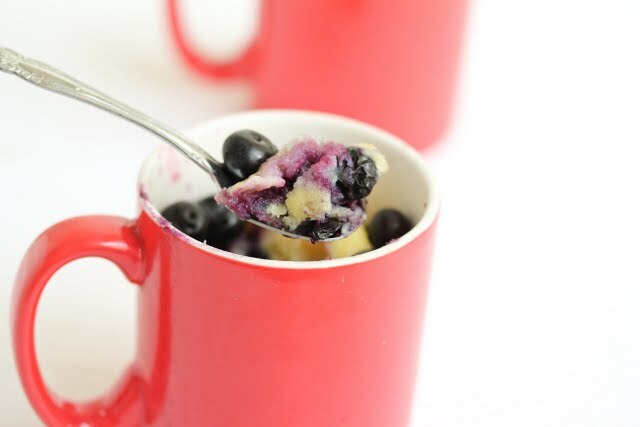 This light and fluffy mug cake has fresh blueberries and only takes a few minutes to work. 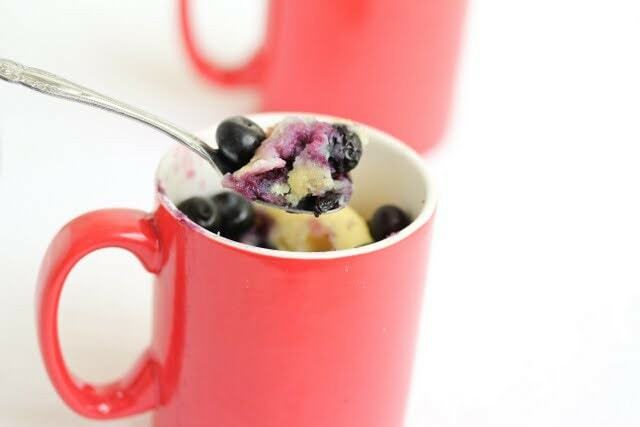 Mix all ingredients except blueberries in an oversized mug until smooth. Drop in fresh blueberries. Heat in microwave for about 1 1/2 minutes. Cool for a few minutes and eat while warm. what a great recipe. it has been super cold and rainy in Paris lately so i am definetely testing this recipe. thanks for the post. bisous fois dix! I just love the idea of cake in a mug! So cozy and fun! I love it too. And so easy cleanup. Even on my most tired days, I can muster the energy to make a mug cake! Haha. Yup, perfect for one. I’m so excited that you made this recipe! It’s about time. I LOVE blueberry pie, but obviously it’s not really the kind of thing you can just “make for dessert” one night. You need a plan and a lot of people. This is PERFECT for me and I can’t wait to try it out! I’m surprised I haven’t seen more mug cake recipes out there other than variations on chocolate. I hope to correct that! Oh I love this recipe! I really like all of the mug recipes you have made. I can’t wait to try them all! I hope you like it! It’s not as sweet as the chocolate one, but I really like it. Seriously. I’m just surfing around, minding my own business, when I come across one of your current ‘mud cakes’ on Food Gawker. This was at 10:10 pm. tonight (EST) Curious, I come here, and I find this blueberry mud cake. A MUD cake? Hmmm… I ask myself ‘could this really work?’ And it so happens that I have some frozen blueberries that I picked in the summer. Happy serendipity. So I whip this up. It is now 10:33 and the cake has been created, cooked, cooled and consumed. And I am sitting here, shocked, yet happy. Did that really just happen? I head to our lake house tomorrow where there is a full pantry, and leftover Nutella and Peanut Butter from Christmas baking. You are my new best friend, and yet, somehow, I think you could be dangerous. Hugs from Lisa. PS. Frozen blueberries work beautifully. 10:39 pm is past my bedtime…I meant mug cake. Not mud cake 🙂 Do you have a version with Kahlua by any chance? I’m so glad you like it! These are so easy it is very dangerous. No Kaluha one yet, though funny you should ask because just today I thought I should try making one. Thanks for the really sweet comments! I tried this today. I am sorry it was not good. I’m sorry you feel that way. I liked it and I know other people who have. But of course everyone’s tastes are different. I love this! It’s like blueberry pancakes on steroids! I doubled the blueberries and it still came out wonderful. A little whipped cream on top makes it extra special! I made this but instead of 3 Tablespoons of oil I did 1 Tablespoon and used skim milk in place of it! It was amazing! I’m glad it still worked with the skim milk replacement! Aw, I’m so happy to hear that! Love your mug cakes! Do a cheese mug cake please? Hmm, I’ve never had cheese flavored cake other than the normal cheesecake which isn’t really a cake. Not quite sure how to tackle making it into a mug cake. I’m glad you liked it! It is hard to see if it’s cooked all the way through when it’s in a mug. I usually try to use a spoon on the side between the cake and the mug, and dig the spoon down towards the bottom of the cake and then stick a knife or fork into that section to make sure it is all cooked. 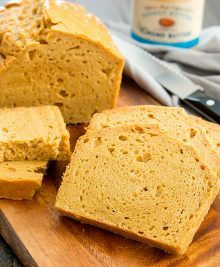 I am looking for easy, healthy, snacks for my grandchildren, and I can’t wait to try this. I am going to try and use 2 tbsp non-fat yogurt, and 1 tbsp of no salt butter. Has anyone tried using dried cranberries, nuts and orange juice for a cranberry-orange cake mug? Thanks! Hi.. i tried your recipe and this was my second try at any mug cake.. i really liked it except that the taste was too eggy..may be ill try it again with half an egg..also it took 3 mins to cook it through. But i will try it again for sure! The problem with the white cake based mug cakes is that they can be slightly egg. It helps added lots of blueberries and stuff. I would recommend trying one of my chocolate ones. You don’t taste the egginess at all with the chocolate, nutella or peanut butter ones I’ve done. Hi! 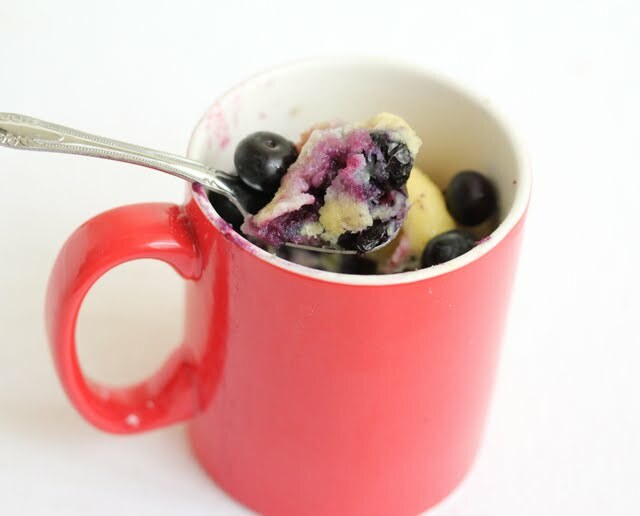 I will definetly try this recipie tonight, I´ve been looking for a blueberry cake in a mug for a while I love the idea. As you say most of them are chocolate, the last one I tried was banana and soo good. Banana bread is my favorite so I wa exstatic when I found it. I´ll leave it here for anyone that might want it. I just made this recipe. It turned out pretty well. I get what ppl are saying about there kind of being an egg taste to it but that just furthers the taste of bread and butter pudding to me! Yummo. 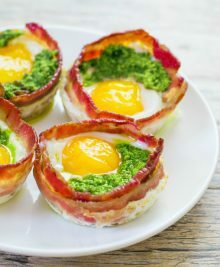 thanks for this awesome recipe. I was a bit nervous when it came out of the micro (after 3min) because it looked almost custard like on the top but, I scraped that part off and OMG!!!! Fantastic!!! I was looking for a non chocolate sweet fix and I have so found it! So glad you enjoy this one! what do you mean by oil? what kind of oil? Thank you for making my dream come true! Not much effort and single serving cake. Bliss. I have a lot of other mug cake recipes. I hope you check them out! After having foot surgery and being alone for two weeks while my hubbie was out of town on business, I had to satisfy my cake cravings by trying the blueberry mug cake. Wow, it was wonderful. I used olive oil because that was all I had in the pantry. I also love the flavour of blueberries and lemons so I grated a bit of lemon rind into the batter. I used egg whites and added a few extra berries and well….LOVE, LOVE, LOVE! Two minutes later and a dollop of whippped cream on top, I had a mug cake that was light, fluffy and tasted awesome! Thanks for sharing this recipe Kerbie. I can’t wait to try others! Thank you! This cake was amazing! I also put some syrup on top by crushing 1/8 cup blueberries, 2 tbsp of Splenda and 1 tbsp of lemon juice with some zest for extra flavor. It turned out very moist and delicious!